It’s also very, very pretty. On A Roll—a pun that refers either to rollerblading or how hard I rolled my eyes when reading it—is an open-world game about “performing creative tricks on rollerblades.” So basically, ramps and grinds and flips and things. It looks like hell(a fun) on wheels (PUNS ARE A DISEASE GET OUT WHILE YOU STILL CAN). I really like the way it looks, though not so much how it moves. The animations are distractingly creaky and robotic despite apparently extensive mocap sessions. Then again, the game isn’t done yet, and the developers say that tightening up the animations is one of their biggest priorities. On A Roll is currently on Steam Greenlight and Kickstarter, and it’s one of the more promising-looking projects I’ve seen on either in a little while. It’s aiming to pull in $50,000, and it’s already a solid chunk of the way there. 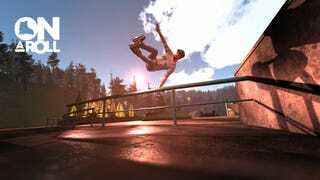 The developers have clearly managed a decent amount already, but they’re hoping to hire more staff, cut deals with some professional rollerbladers, grow their open world, and—maybe, eventually—add Oculus Rift support so we can all puke our brains out just like real rollerblading professionals do every time they lace up. I haven’t gone rollerblading in at least a decade, but thanks to Jet Set Radio and Tony Hawk, any video game with tricks and wheels automatically turns me into a swooning puddle of nostalgia. Also, there’s a weekly roller disco in the park near my house every Sunday, so I like to think that makes me an expert. In my expert opinion, On A Roll looks solid. What do you think?